From the Creators of Shrek and Madagascar comes the funniest movie of the year! Prepare for awesomeness with DreamWorks Animation's KUNG FU PANDA. 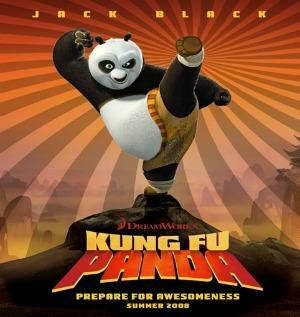 Jack Black is perfect as the voice of Po, a noodle slurping dreamer who must embrace his true self - fuzzy flaws and all - in order to become the legendary Dragon Warrior. With high-kicking humor, tons of kung fu action, and groundbreaking animation, KUNG FU PANDA is a heartwarming story of courage for the whole family! More details of KUNG FU PANDA on wikipedia. Original KUNG FU PANDA VCD released by Reliance Home Video & Games comes in 2 disk VCD pack. While processing the order, we bubble wrap the VCD in its original packing and send it in sealed plastic or carton pack. We don't offer download of the Movie KUNG FU PANDA, nor we send free poster of the Movie along with its VCD order. We also don't offer free wallpaper or song download of the Movie. Poster and other accessories of the Movie can be purchased separately. Buy English VCD KUNG FU PANDA and watch them at the comfort Of your own home. Online shopping KUNG FU PANDA VCD, Buy KUNG FU PANDA VCD, purchase original English VCD of KUNG FU PANDA. Online store to buy KUNG FU PANDA VCD	, online VCD store india, buy English VCD, watch English movie KUNG FU PANDA videos online. We don't offer VCD renting for English movies online, Buy Original KUNG FU PANDA VCD @ discounted and cheapest price online in India.